There are two common kinds of water heater used now_ gas and electrical. Here we just mention tank water heater although we also serve on tankless water heater. There is not any better than the other. The same size, natural gas kind is often more expensive than electrical one a bit. However, gas kind is often more economy on bill monthly than electrical. On the contrary, electrical kind has less problems than gas one. We can install all of kinds of water heaters. How to have a water heater lasting longer. It is a concern to the users. 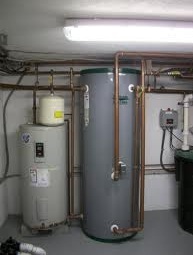 Average life of a water heater is around thirteen years. The older it is, the more leaking chances unknowingly happen. Thanks to the help of modern technology and additional devices applied, water heater lifespan could be longer significantly.